"I split up with my friends and headed for a paradise to rest my body and soul for a few days. 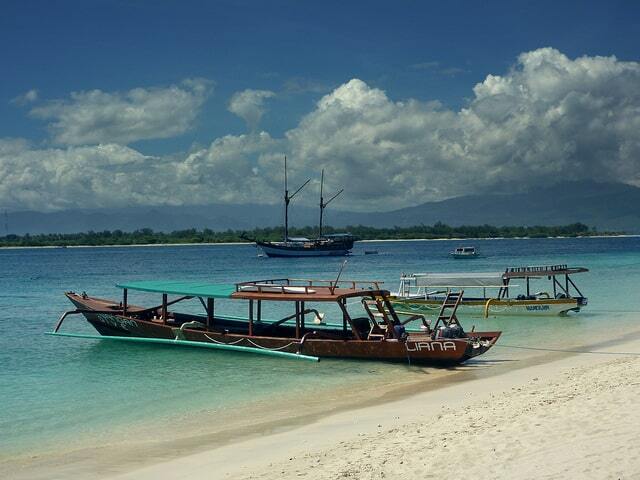 That paradise is one of the Gili islands, the Gili Trawangan. Gili Trawangan is the most popular out of the 3 islands (Gili Trawangan, Gili Meno and Gili Air) and I was bombarded with backpackers and loud noises from parties as I arrived on the island late in the evening." The Gili Islands are an archipelago of three small islands � Gili Trawangan, Gili Meno and Gili Air � just off the northwest coast of Lombok. The islands are mainly populated by "Sasak". This population group is originally from fishermen nearby Lombok. They live currently on tourism and fishing. "Gili" means "small island" in the language of the Sasak. Around Lombok there are more than 26 Gili's (small islands) The south-western Gili's are located off the coast of the port town of Lembar, including Gili Nanggu, Gili Asahan and Gili Gede. With the establishment of a few hotel accommodations on these islands, they have attracted increasing attention from tourists in recent years. The Gili Islands belong, like Lombok, to the Lesser Sunda Islands. All the islands are known for their amazing diving. With a constant temperature of 30 degrees Celsius, you can admire lots of fish - including manta rays, turtles and sharks. By dynamite fishing a few years ago the existing coral around Lombok has been destroyed. The Gili Eco Trust is trying to repair the damage with the project Biorock, which uses electricity to grow coral rapidly again. There is on the Gili Islands still blissful serenity. By the absence of motorized vehicles, you get the impression that time has stood still here. On these pristine, isolated islands there's yet no mass tourism. Besides diving is also snorkeling around the islands a great experience. With your snorkel gear, you can walk from the beach into the water and swim to a nearby reef. Furthermore, you can kayak around the islands or take a tour with a sailing boat with glass bottom to admire the underwater life. The Gili islands are so small that you can walk around the island in a short time. Do not try to swim from one island to another. They are not far apart, but there are strong currents between the islands and there are atready some adventurers drowned in their attempt. Each island has beautiful white sandy beaches, crystal clear water and spectacular coral reefs. You can snorkel very well and you will find the best diving spots. Tourists are attracted from around the world to come to the islands for sun, or snorkeling and diving and for its beautiful beaches. Each island has professional scuba dive centers. Due to their close proximity to the Equator, the Islands have a warm, Tropical climate with a dry and wet season. With Mount Rinjani to the immediate east on Lombok, and Mount Agung to the west on Bali, The Gilis are somewhat sheltered and actually enjoy a slightly drier Microclimate when compared to the surrounding archipelago. Dry Season usually last from May until October, with Monsoon season starting in November and continuing through to April. Temperatures range between 22 �C to 34 �C, with an average annual temperature of around 28 �C. I have been to Gili twice now, staying on Trawangan. The first thing you notice is there are no cars, the modes of transport are pushbike, walk or donkey & cart. There are numerous restaurants on the island with Scallywags being one of the most well known. The food there is delish, however, on our last visit the service was terrible so we ate elsewhere for the remainder of our stay. There are boat trips that take you snorkelling off all 3 islands for only $10. 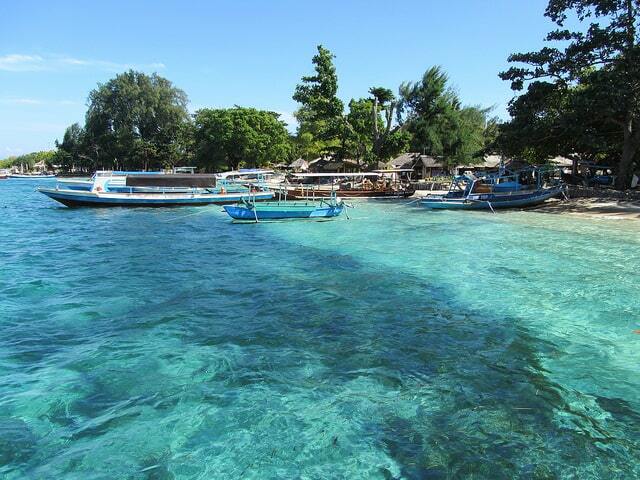 This is a must do as Gili is known for it's dive sights and you are guaranteed to see some beautiful marine life. If you are lucky you will even see a giant turtle or 2. There is also several skuba diving schools. Hotels range from backpackers to 5 star with all prices being reasonable. We stayed at the Black Penny Villas, these were nice, clean and central to everything but the rooms were very small. You can hire a pushbike and ride around the island in about 40 minutes but be aware that there are parts of the track that are sand- soft sand- and you will need to walk your bike for parts of the way. Take a towel as you will probably see several inviting spots to stop off at and have a swim. Gili Trawangan also has a turtle sanctuary where you can visit baby turtles. I believe this is quite a successful program and something for those involved to be proud of. The islands are very close to Lombok. You can catch a boat across with the locals to or from Lombok for about $7 per person but don't be surprised if it looks overcrowded as safety laws don't really apply there. We caught one of these boats and while I admit I was a bit nervous, we did get there safe and sound to our amusement. The water is so beautiful, you could easily sit all day at a restaurant or bar just relaxing and enjoying the view.